The children often use this activity for enjoyment with their close group of friends. Arts and Crafts are performed in a relaxed and unrushed setting. I find this is a great way for children to unwind and concentrate, using bilatera coordination skills. Colouring, drawing, cutting, all require your child to use both of their hands together. 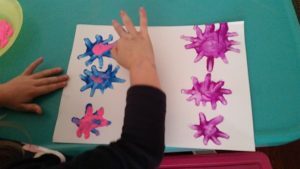 … Fine Motor Coordination – In order to draw shapes, cut patterns, and write, your child is required to use their fine motor coordination. This is a precursor to writing and often ignites an unknown interest! Once your child can establish (in their own time), that they can create something that is performed primarily by them (and not the teacher) , then they will develop confidence to extend their skills and experiment. The benefit of regular opportunities to be creative strengthens intellect. Sharing their work with their families is important to their self esteem . I have had the pleasure to observe many fine artist emerge over the years!